New Flexima UXGA Cables deliver high performance AND flexibility. These ultra thin cables are highly flexible to make installation in even the tightest areas a breeze. 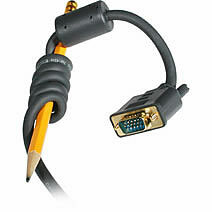 Unlike cheap VGA cables, the Flexima cables will not coil or snag during installation. And, the low profile connector helps you install this cable in places other connectors won't allow. Quality is also proven in the performance of these cables. Featuring ferrites, double-shielded twisted pairs, and triple-shielded coax, these monitor cables deliver the signal without ghosting or distortion. Flexima UXGA cables are ideal for video presentations, home theater and HDTV applications, classroom environments, POS, and server rooms. Or simply organize your work area for maximum comfort and efficiency.